At some point, you are going to deal with some sort of an injury. Maybe you already have. Maybe you are dealing with something right now. 1 - Do not try to solve pain on your own. Something starts to hurt, with or without a reason, and you ignore it. Sometimes your pain will vanish as quickly as it arrived, never to be heard from again. Sometimes it comes back with a vengeance. It is more intense and stays around longer before disappearing again. Whether you are dealing with pain after surgery or pain that has magically appeared with no known origin, it is never a good idea to self-diagnose and self-treat. Go get checked out and know what you are up against so you do not make things worse. At worst, you will know what the injury isn’t and that is valuable information as well. Rehabbing injuries is complicated. Don't go it alone. Make sure you are working with a qualified and skilled clinician. 2- Post surgery. Don’t skip your physical therapy. Congratulations, you have made it out of surgery. Now what? Hopefully, you have spent time prior to surgery doing some prehab exercises to prep the body for where you are now. If not, shame on you. There are many more physical, emotional and psychological symptoms that you will also be dealing with. As you work to manage your symptoms in the beginning, you have to pay attention to HOW you are moving. How you start to move now will stick with you throughout rehab and beyond. If you have pain, that is a legitimate reason for a movement to be compromised. But, it also means that whatever you are doing is something you probably shouldn’t be doing. Try to look at tasks in one of two ways. Have to. Want to. You want to move that sofa to the other side of the room. You have to walk around each day to function. If there is something you want to do but it causes pain then you do not do it. Period. If there is something you have to do and it causes pain, you have two options. The first, which is the best, if applicable, is to have someone else do it for you or let them help you do it. Or, you find the best possible way to do it that causes the least amount of pain to get it done. This is really not a good idea, but having worked with enough people, I know this situation is going to come up at some point. Some of you are worse than others at following the have to/want to guidelines and you know who you are. The initial phase of your rehab should also breakdown how you are performing your daily activities. Walking around without your assistive device and limping or shifting to the side every time you bend is not helping you get better. These abnormal movements will only slow down the rehab process. Do not leave these to chance. Everything needs to be done deliberately and with focus. You need to manage symptoms appropriately and avoid developing bad habits during the initial stages of rehab. 3 - Your post-surgery home exercise program. This picks up right where the last part left off. If you have had surgery before and decided to skip physical therapy or some form of post-op rehab, you may have experienced some of what I am about to discuss. If you are scheduled to have surgery soon or know you will need some form of it in the future, DO NOT skip your rehab. Even if the surgeon or some other people say that it is not necessary, request it. Demand it if you must. The video at the end will discuss why this is important, but let me give you a real-world example. I have a client at EBM who was having some hip pain (the pain had been present for quite some time but was getting worse). Actually, it was more groin pain but this is where the hip joint is located so I suspected the hip joint when the initial conversations regarding the hip took place. 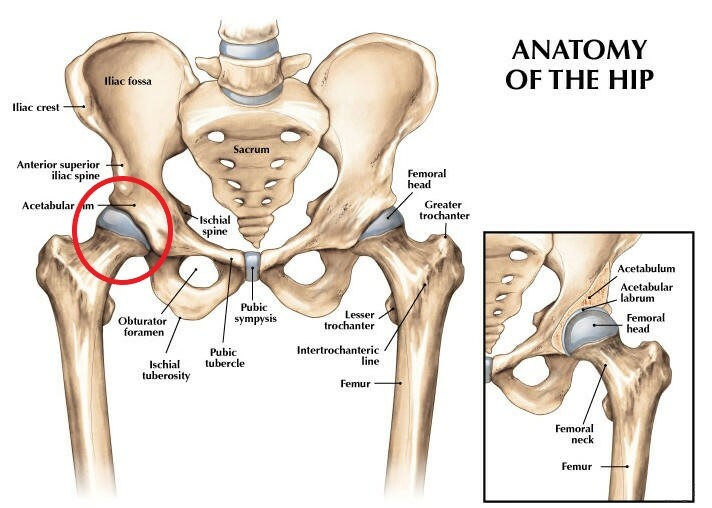 The red circle is highlighting the actual hip joint (where the femur meets up with the hip). It is in the groin area so sometimes your groin pain could be something pertaining to the hip. After evaluating the hip, I encouraged the client to get some additional testing and imaging to confirm or deny my suspicions. It was as I suspected. The hip in question was bone on bone and was in need of a replacement. We spent months working on getting strong and preserving range of motion (ROM) in the hip. We basically had months to work on prehab. And it was amazing. My client was a rockstar (not my words) in the hospital with her ability to move around right away. She had worked hard and all that hard work was going to really help with the post-op part of rehab. My client did not go to outpatient physical therapy but instead came back to EBM. Even though we had spent months working on exercises in preparation for the surgery, when the client came back, we still had to retrain walking with and without an assistive device. The client was instructed to perform some partial ROM squats while holding on to the sink at home. We did them at EBM with a similar setup and I noticed the client was shifting to the replaced side. The client had no idea it was happening. If this was allowed to continue all the way through the rehab process, it would have potentially prolonged the healing on the replaced hip and would have caused problems in one or both knees and the opposite ankle. Another little piece of this post-op puzzle was using crutches and a cane. Due to the weakness and apprehension on the replaced side, a lot of stress is put on the upper body. Left unsupervised, this client would have had at least some shoulder impingement and possibly a more serious rotator cuff injury. We were able to focus on walking mechanics but also modify other exercises to reduce stress on the upper body. Please, I beg you, do not skip your physical therapy. Or at least make sure you are working with someone who can address the subtle changes. If not, you will finish your rehab with new aches and pains. HOW you perform your exercises and HOW you walk post-op matters. Do not leave things to chance. 4- The mystical entity known as chronic pain. For our discussion, chronic pain is pain that appeared or appears without a cause or incident. It basically comes out of nowhere, as far as you can tell. It does come from a place, but it is never obvious. Chronic pain is also something you have been experiencing for more than 3 months or have experienced recurring episodes over a long period of time (typically years). You may often have periods in time where the pain goes away only to return with greater fury and for a longer duration. Here’s the deal. Chronic pain always leaves clues. They are rarely easy to locate, but they are there. They are almost always connected to how you move. This abnormal movement does not cause immediate pain. It is not like touching a hot surface. The movement can be off for years before it starts to hurt. At this point, it appears to come out of nowhere. But like I said earlier, there are clues and your movement patterns can give us the answers we need. Since the movement patterns are often in place for some time, you also develop compensatory movement patterns over this same time. We have to work back through these compensations to get to the root of the problem. As you may have imagined, this will take time. Chronic pain does not fix quickly. Anyone who promises you otherwise is selling something or is just outright lying. The process is long, frustrating, messy, complicated but necessary. You have to unlearn the old way you are doing things (which is hard-wired into your brain) and develop new ways of doing things. This neuromuscular tug-o-war creates a jumbled mess in the beginning. You will not know which way is up for some time. But, trust me. There is an end and the end brings about a version of you once thought lost. Ignore the title page on the video. This type of injury had nothing to do with surgery. This type of pain is something you have been working on for years and probably never knew it. 5 - Fixing one problem often reveals another one. At this point, we have addressed post-op rehab and chronic pain. We should be good to go, right? Oh, I wish it was that simple. This is best summed up by Shrek. Ogres are like onions. They have layers. You, my friend, also have layers. Here’s the deal. I mentioned the process is long, frustrating, messy and complicated. I meant it. I also mentioned that you will develop compensatory movement patterns and you will have to work back through these compensations to get to the root of the problem. I also meant that. What this means is that as you fix one problem, it uncovers another one. So just as you are about to strut across the finish line, another manifestation of pain shows up like one of those Freddy Kreuger nightmares. This guy used to be wicked scary. At this point, you may feel discouraged as if what you are doing is not working. This couldn’t be further from the truth. You are one step closer to actually resolving the issue. The key at this point is to re-evaluate where you are, modify the plan and continue to move forward. Think of rehab like a coil. As the coil is going up, you are progressing and feeling good. Things are continuing to get better. As each turn of the coil reaches its peak, it levels off and sometimes will dip down before climbing up again. The leveling off of the coil is when you start to peel back a new layer and meet your old, new friend. Any dip in the coil represents the feeling of regression. You feel like you are going back, when in fact you are still moving forward (or up in this example). the ability to get back to doing things you didn’t think you would ever do again. I know this sounds a bit crazy but I see this scenario play out all the time. Make sure you have a plan, modify the plan when it is time but maintain your consistency throughout. Ogres have layers. Onions have layers. Your injury often has layers. We solve one issue which reveals another issue that was being masked. Let the fun begin. 6 - Modify your approach to sets and reps. When you are working on rehabbing injuries and getting out of pain, you cannot afford to just follow the same old routine when it comes to your sets and reps. I mean, you can, but it isn’t going to work. I have talked about compensatory movement patterns due to injury, compensatory movement patterns after surgery (even when prehab was done) and the idea of layers where fixing one issue exposes another. The ol’ 3 sets of 10 aren’t going to be the right tool for the job. You need a different approach. My suggestion is to start by inverting your rep scheme. Instead of 3 sets of 10, try 10 sets of 3 (or some variation of this). Even though you complete thirty total reps in both scenarios, the shorter sets of three allow you to preserve technique, manage pain, minimize inflammation and manage fatigue. Remember, fatigue destroys technique! This is the last you need when you are trying to get out of pain. Do not blindly follow any set and rep scheme. Learn to listen to your body and do not just count reps. Make each rep count. This is best done with shorter, more frequent, sets. Another often overlooked part of rehab (and most exercise programs, to be honest) is improving movement quality and motor control. In its simplest terms, motor control is how your nervous system produces movement. It is very complicated, but that will suffice for now. Inverting your reps is also one of the best strategies for improving motor control. Even with good strength, you can still have crappy mechanics. Failure to address these issues just means you will be wrestling with this pain (or different pain) in the future. Traditional sets and reps often have no place during the rehab process. At least, no initially. Inverting the rep scheme is an easy way to manage fatigue and preserve technique. Think 10 sets of 3 instead of 3 sets of 10. Sometimes perform a set of 6 reps as 6 mini sets of 1 rep. There you have it. I have laid out things to watch for in case you ignore my advice and decide to tackle your pain solo. Again, not a good idea, but I know how you are. Promise me this. If you go it alone and your situation worsens then reach out and let’s get you back on track together. Deal? I am ready to rehab the right way! Have you downloaded your copy of the 7-Day Strength and Mobility Reboot? Why not? It is a FREE guide to get you moving better and helps to start getting you out of pain.